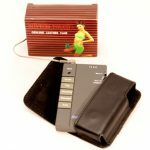 The Rhythm Touch Deluxe Package Electrical Muscle Stimulator is the easiest-to-use and longest-lasting electrical muscle stimulator on the market today! 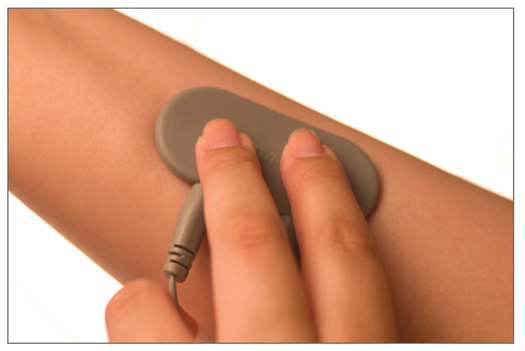 It is a Class II medical device that uses Electrical Muscle Stimulation (EMS) and Transcutaneous Electrical Nerve Stimulation (TENS) to stimulate your muscles while blocking pain signals from the brain. The combination of the two types of stimulation provides release from the agony of aching muscles. 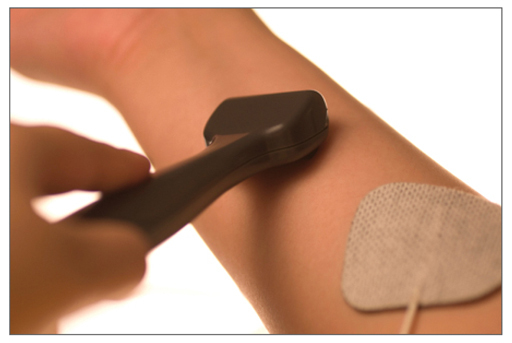 Purchasing our full system Rhythm Touch Deluxe Package is the best way to experience this reprieve from muscle pain. 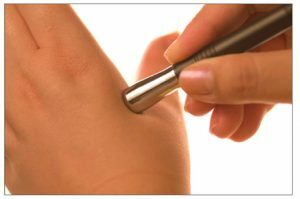 It is the most complete low-frequency pain relief system available. The deluxe package offers the electrical muscle stimulator with all of its normal accessories along with extra products you’ll love. One extra product is the Genuine Leather Case. The case allows you to hold the Rhythm Touch – 2 Way on your belt, permitting you to take it with you wherever you need to go. It protects the Rhythm Touch in your purse and acts as a handy storage while at home. Specially-designed Acu-Feet Therapy Slippers deliver stimulation to the base of your feet and are included in the deluxe package. The Acu-Feet Therapy Slippers are specifically made to be used with the Rhythm Touch or other quality stimulators. They have special acu-therapy points that focus on reflexology areas in your feet. 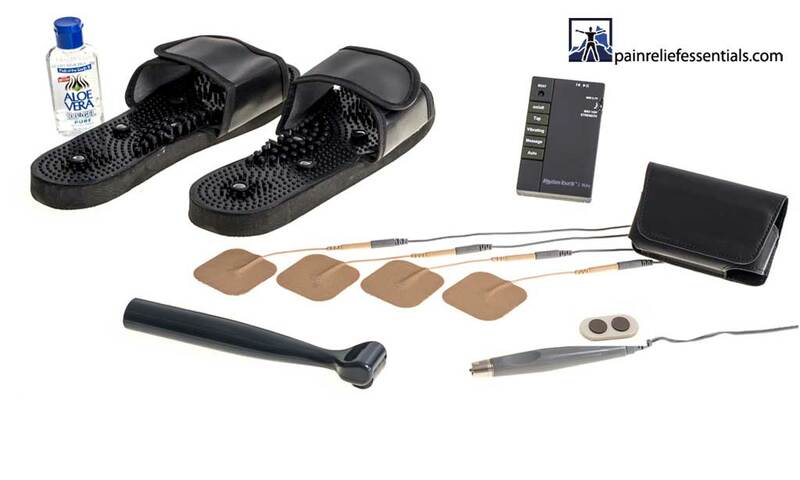 With the slippers, you will be able to stimulate the bottom of your feet using one of the channels of the Rhythm Touch while simultaneously using the other channel to stimulate a separate area of your body. The Rhythm Touch Deluxe Package also provides you with extra pads and our proprietary manual printed in an easy-to-read format with color charts. Why not take advantage of special package savings while finding the pain relief you need? Save 10% on the Rhythm Touch Deluxe Package. The ACU-FEET THERAPY muscle stimulating slippers designed for the Rhythm Touch. 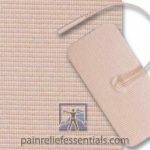 One extra set of four premium Pain Relief Essentials brand of Rhythm Touch Replacement Pads. Products are normally sent the same or next business day from the day your order is placed. During holiday periods there may be delays. If so, next day delivery via United Parcel Service will arrive two business days after your order is placed. Check out the reviews tab to see more about what our customers say about the Rhythm Touch or read more testimonials. I wanted to write and say thank you for introducing me to the “Rhythm Touch.” I’ve got to admit I was skeptical at first, but I’ve really had great results! You see, over 20 years ago I injured my back plus I have degenerative disc disease. I have now suffered from chronic pain 24 hours a day, every day for almost 20 years. I’ve tried just about everything imaginable, including surgery. I currently use pain relievers to manage the pain and yet that still is not enough. Well, I had basically accepted my fate and had given up. That’s when I met you. You asked me to try the Rhythm Touch. I did, not really expecting anything to happen, but it did work! In the evenings when my pain is at its worse I usually stay down and do the best I can. But with the Rhythm Touch I’m no able to take the edge off the pain and get back on my feet for the evening. So much so that I am now able to go out with my wife and enjoy an evening. While it’s not a cure (my back is just too messed up), it is a tool I can use to take the edge off and regain some quality of life. For this I am truly grateful. I highly recommend the “Rhythm Touch.” It sure has worked for me. We saw this at the American Quarter horse Congress . My husband purchased it . I have plantar fasciitis and the gentleman said it would fix it after 5 daily treatments. Yea right , I had shots and therapy for it and nothing helped . After 5 days of using the foot slippers I didn’t notice a difference then one day I woke up with no pain . I also had tendinitis in the shoulder and i used it first sign of pain. I woke up in more pain but by the end of the day no pain. Great product .